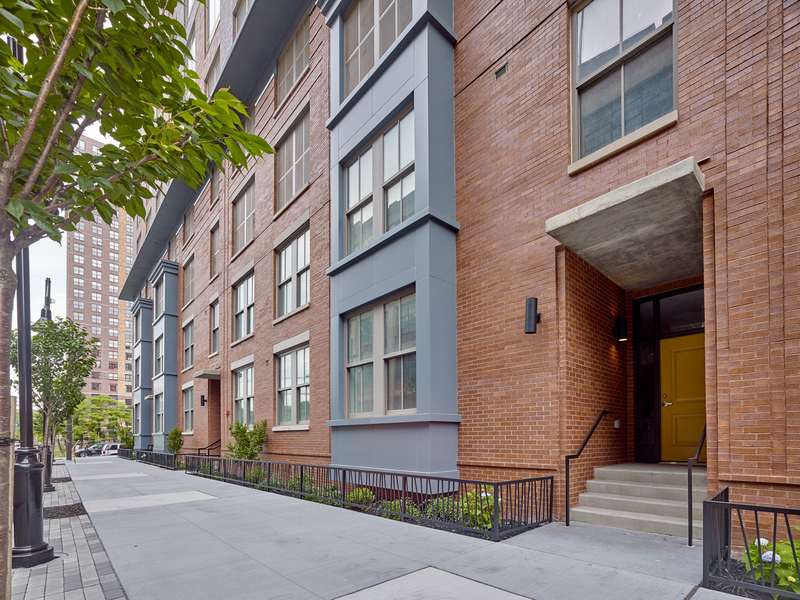 Manhattan Building Company has released a limited number of two-story townhome apartments at Soho Lofts, the industrial-inspired collection of 377 rental homes in downtown Jersey City’s fast-emerging SoHo West (south of Hoboken, west of New York City) Community. Named the Townhome Collection at Soho Lofts, the exclusive offering of just eight loft-style residences boasts a number of desirable features that make it unique in Jersey City’s rental market, including private street entrances, first-floor master bedroom suites, separate den/office space, open living/dining rooms, eat-in kitchens, huge walk-in closets and large laundry rooms with side-by-side washer/dryer and utility sink. Best of all, the homes provide the added benefit of the overall Soho Lofts rental community, providing residents access to a long list of resort-style indoor and outdoor amenities and hotel-like services. Each floorplan offered in the Townhome Collection is distinct with an interior layout all its own. The upscale three-, four- and five-bedroom residences offer 4 to 4.5 bathrooms and range from a 2,371 square-feet to well over 3,000 square-feet. The apartments are priced from $6,995. The uniqueness and desirability of the Townhome Collection has already captured the attention of discerning renters. Leases have already been executed on the first of the apartments prior to officially being brought to market. Residences in the community range from 1,377 square-feet to 1,766 square-feet and provide lavish loft living with ten-foot high ceilings, expansive windows to bathe apartments in natural light, exposed duct work, European white oak flooring, luxury kitchens with designer cabinets, granite countertops, stainless steel appliances and lavish bathrooms with glass enclosed showers and maple vanities. Many apartments also offer magnificent views of New York City and Jersey City’s downtown skyline. A full package of forward-thinking, world-class amenities is offered at Soho Lofts. Designed to provide renters a socially-infused urban lifestyle, the professionally-decorated communal spaces radiate a chic and trendy feel that’s on par with fashionable resort destinations and designer five-star hotels. The unquestioned hub of outdoor recreation is the Soho Summer House, a 15,000 square foot pool deck and amenity club. The resident-only area is the perfect place to soak up the sun with an inviting Infinity edge pool with aqua jets, private poolside cabanas, individual daybeds, cooling outdoor showers and children’s misting system. Dynamic shared amenities at Soho Summer House are sure to foster a sociable vibe. Fireside seating and gas grills with preparation area are just two of the spaces that will set the joyful mood and encourage neighborly interaction. Community activities will abound with a full screen movie theatre and resident event pavilion where City Homes & Gardens, Soho Lofts’ exclusive management and leasing agent, hosts summer-themed gatherings and parties. Those seeking individual relaxation and privacy can wind down in the deck’s separate hammock area and tranquil Zen garden. Other outdoor amenities offered at Soho Lofts are an oversized dog park and children’s playground. Found inside the community are contemporary lounges, including a retro arcade, gaming areas and tech lounge, fully-equipped demonstration kitchen and private party room, surround sound media room and private conference rooms, children’s playroom, dog grooming suites, state-of-the-art fitness center with ten-person sauna and indoor/outdoor yoga room. The full-service resident experience at Soho Lofts is further enhanced by attended valet parking and 24-hour concierge in its magnificent and soaring two-story lobby. Situated at 273 16th Street, Soho Lofts location provides easy access to some of New Jersey’s most dynamic urban centers. Within minutes, residents can enjoy all that Hoboken and downtown Jersey City have to offer. Complimentary daily shuttle service is provided to nearby PATH stations and NY Waterway ferry terminals. The building is also convenient to the New Jersey Turnpike extension for an easy commute into north and central New Jersey. Soho Lofts is the next chapter of SoHo West, a new neighborhood concept that’s brought upscale rental buildings and a diverse mix of shops, services and conveniences to Jersey City’s Hoboken border. Already open within SoHo West are 8 Springs Studio, a Pilates and Yoga studio; Viaquenti Academy, a bilingual pre-school; Brewshot, a coffee shop/bar restaurant that has several other locations in Jersey City and NYC; The Art House, a non-profit that includes a 99-seat black box theatre and Cycle Mix, a spin cycle establishment. A 5,000 square-foot Fresca community market is also slated to open soon. For additional information on Soho Lofts, please visit www.SoHoLoftsJc.com or call 201-268-7586.